The USTFCCCA has released its NCAA cross country regional rankings to reflect the results of the last weekend. Both the men's and women's teams' rankings changed, one for the better and one for the worse. The Villanova women, previously ranked #5 in the country and #2 in the Mid-Atlantic region behind the regional and national #1 ranked Georgetown Hoyas, have moved up to the top spot in the region, surpassing Georgetown, which dropped to regional #2. This obviously means that when the national rankings are released tomorrow, Georgetown will no longer be #1 in the rankings. Georgetown and Villanova both participated in the Paul Short Run this past weekend. 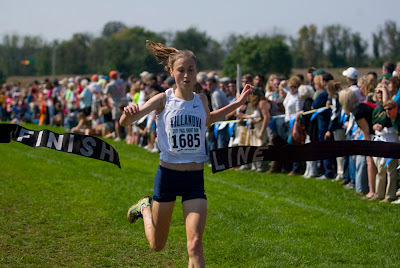 Neither team's #1 runner (defending NCAA champion Sheila Reid for Villanova and NCAA runner-up Emily Infeld for Georgetown) competed, but Villanova, behind the winner individual effort of Bogdana Mimic, finished a close second to the full-strength national #3 Providence, while Georgetown finished 4th. Expect Villanova to jump to 2nd or 3rd in the national rankings tomorrow, surpassing at least Georgetown and Providence. On the men's side, a 4th place finish at Paul Short dropped the Villanova men from #2 in the Mid-Atlantic Region (behind only Princeton) to a #3 spot. Georgetown, which was second at Paul Short (and 34 places better than Villanova) jumped the men into #2 in the region, with Princeton saying put as the highest ranked team in the region.